Joanna Lumley, Twiggy and actor Woody Harrelson are a mong the familiar faces in the video for his track Meat Free Monday - which he has launched online. Sir Paul has been encouraging people to eat a flesh-free diet once a week to cut down on meat consumption in an effort to slow climate change ahead of this week's United Nations summit. Pals, fans and the former Beatles star himself feature in the promo each holding up signs bearing the words of the song. Sharleen Spiteri, Radio 1 presenter Fearne Cotton and Sir Paul's children Stella and Mary are also seen in the a nimated video which is assembled from photographs. The rearing of livestock for consumption is a major contributor to the production of greenhouse gases which are thought to hasten climate change. 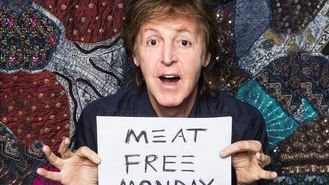 Sir Paul wants to encourage members of the public to sign a pledge to go veggie once a week at pledge.meatfreemondays.com.